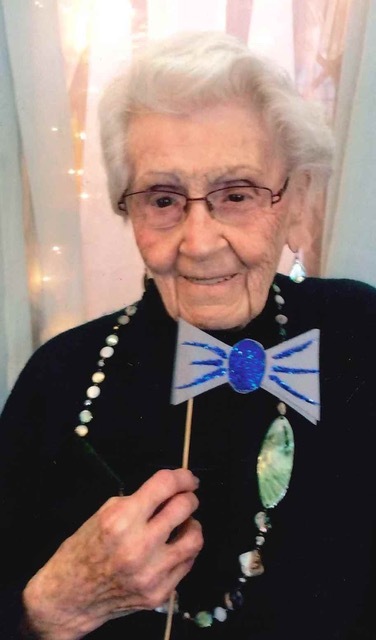 Martha Marie McConahy Hemmerly, 98, a 8 year resident of Watson Memorial Home, Warren, PA. and formerly of Youngsville, PA., died at her residence, Tuesday evening, December 11, 2018. She was born August 1, 1920 in Elwood City, PA. Martha was the daughter of the late Earnest and Goldie Marie Newton McConahy. Martha had resided in Youngsville and was a longtime Elwood City, PA., resident. She was a graduate of Shenango High School, New Castle, PA., and a 1941 graduate of School of Nursing, New Castle, PA. She was employed as a registered nurse with Elwood City Hospital, Elwood City, PA. She was a member of the Youngsville United Methodist Church and a former active member of Wurtemburg Methodist Church where she taught bible school for adults and children for many years and former President of the church Women’s Society. She also organized fund raisers for the church for many years. She had served as President of the PTA in Elwood City, PA. She was active in committees for Girl Scouts and Boy Scouts and children’s sports playground programs. Martha had served as past president of the Youngsville Senior Center and a member of their council. She read blood pressure readings at the senior center. She was an ombudsman for Warren area nursing homes. Martha was a volunteer for 25 years with the Lawrence County American Red Cross Blood Bank and Warren County Blood Bank for 12 years. She was an avid card player. She always opened her home to her children, Jan and Ernie’s friends. She was very involved in their activities. Martha was meticulous at crocheting, making doilies, and baby afghans, etc. She was a great cook, baker and always set an elegant dinner table for her friends and family. She is lovingly remembered as a true lady in every sense of the word. She is survived by her son, Ernest G. Hemmerly and wife, Patricia of Youngsville, PA., her daughter, Jan Marie Napiltonia of Middletown, PA., Sister-in—law, Opal McConahay of Elwood City, PA., 4 Grandchildren – Dana Pence Nelson, Tim, Joe and Adam Pence and 9 Great Grandchildren and 4 Great Great Grandchildren, several nieces and nephews. In addition to her parents,, she was preceded in death by her husband, George Hemmerly whom she married in 1947 in Elwood City, PA., who died August 19, 1972, 1 Sister – Louise Altsman, 2 Brothers – John and Dale McConahy, Son-in-Law – Anthony Napiltonia. I worked night turn for may years with you mother at the Ellwood Hospital. She was a wonderful person and I enjoy working with her. She sure enjoyed a full life. I will always cherish the memories of her. My condolences to the family. Around 1965, my parents bought Goldie McConahy’s house in Wurtemburg, where I grew up and my family lived till my dad’s death in 2015. Louise and Chuck Altsman were the best next door neighbors. While I didn’t know Martha, I feel a connection with your family. God bless through this difficult time. Your mother was a super person. I will always remember her as a special lady who made my mother, Elsie laugh. They had such fun together especially when they played cards. Also, it was great having more long, tall family around! I used to call your mom after she moved. Her voice sounded so much like my moms voice. It was always nice to talk to her. She will be missed.